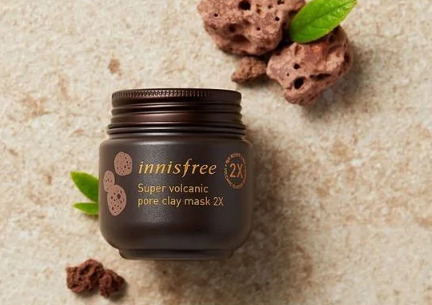 Innisfree clay mask contains volcanic rocks that absorb sebum and impurities to clean your skin pores, 3 in 1: Removes Sebum + Brightens Skin + Treats Blemishes! Soothing and Moisturizing. 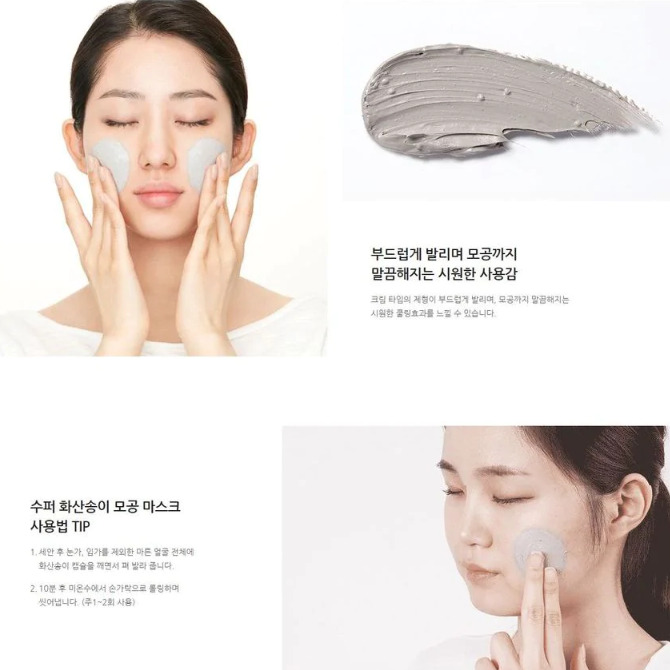 The new kind is called Innisfree Super Volcanic Pore Clay Mask. A more powerful 6 in 1 solution treating pores. Twice as much Jeju Volcanic Cluster from Jeju Islands. Absorbs sebum effectively. Contains AHA to exfoliate and remove dead skin cells. Fresh “cooling” effect during application. Deeply cleansing and reduces pore size. Apply after cleansing and toner, and allow the mask to work for 15 minutes. Rinse with lukewarm water. 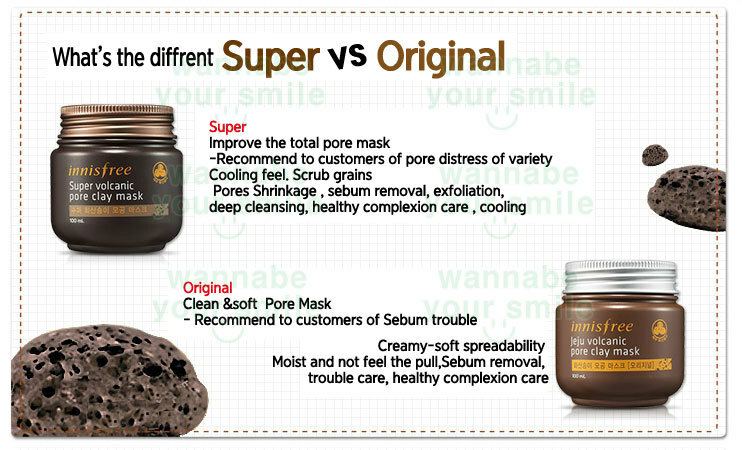 If you compare the masks, then Innisfree Super Volcanic Pore Clay Mask is best for treating pores. 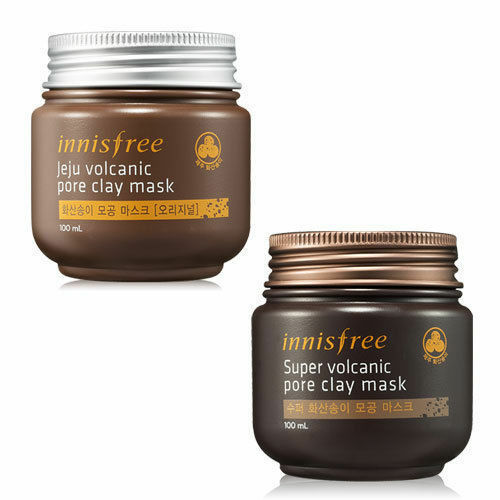 Innisfree Super Volcanic Pore Clay Mask has awarded 22 times by Global Beauty Awards. This mask take care of 6 types of pore concerns including pore minimizing, sebum removing, exfoliating, deep cleansing, healthier complexion and cooling effect. Purifying wash-off clay mask specially designed to detoxify and revitalize skin. Its deep-cleansing formula contains volcanic clusters that draw out toxins and impurities, to minimize pore size, tighten skin and refine texture. After cleansing, adjust skin texture with toner. Spread a generous amount of the clay mask over face. Avoid eye and lip areas. Leave on for 10 minutes and enjoy the cooling effect on pores. Rinse off with lukewarm water while gently massaging face in a circular motion to help remove dead skin cells and excess sebum.